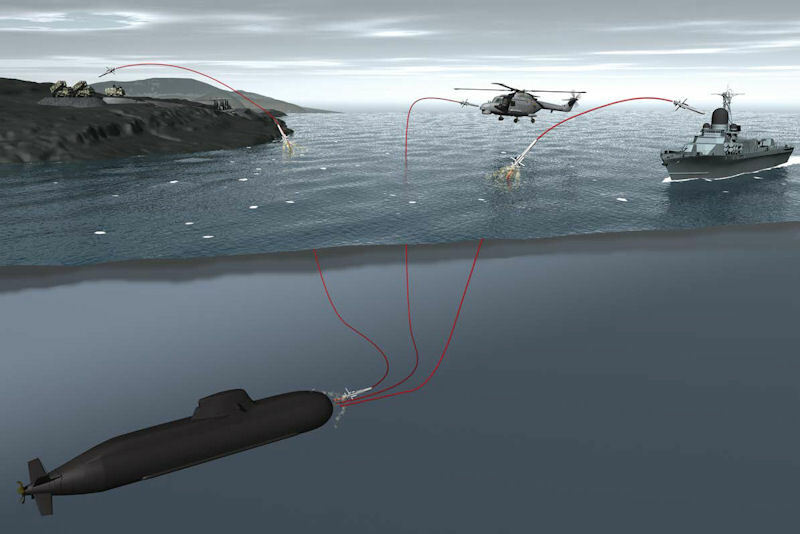 The innovative Interactive Defence and Attack System for Submarines (IDAS) is a lightweight fibre-optic guided missile for submarines. Primarily conceived as a means of self-defence for the submarine against ASW helicopters, IDAS has been developed further into a multi-purpose weapon system that enables the submerged cruising submarine to engage airborne, surface and coastal targets with a high degree of precision. IDAS is a German missile program with Diehl BGT Defense as Prime Contractor and the shipyard TKMS (ThussenKrupp Marine Systems) as partners in ARGE IDAS. Nammo has been selected as Rocket Motor supplier for IDAS, and has participated in the program since 2003. IDAS is a technology demonstration program financed by BWB and the industrial working group ARGE IDAS (HDW and Diehl BGT Defence: 40% each, Kongsberg: 20%). Within the IDAS Consortium, the missile as well as the fibre-optic system are produced by Diehl BGT Defence. 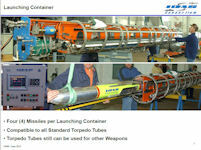 ThyssenKrupp Marine Systems is in charge of the launching container and the system integration into the submarine. Moreover, ThyssenKrupp Marine Systems is speaker of the IDAS Consortium. 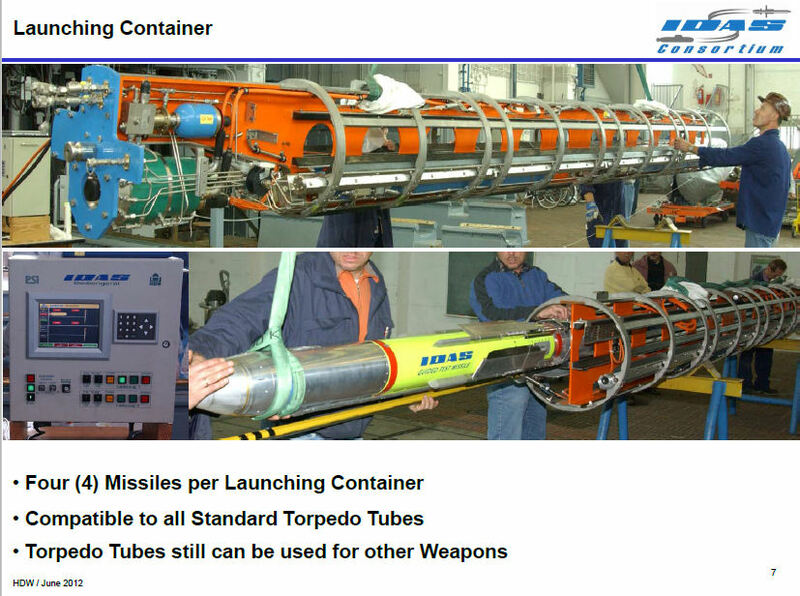 The IDAS system comprises the missile, four of which are housed in a special launch canister in the torpedo tube, and the control console in the submarine's command and control center. 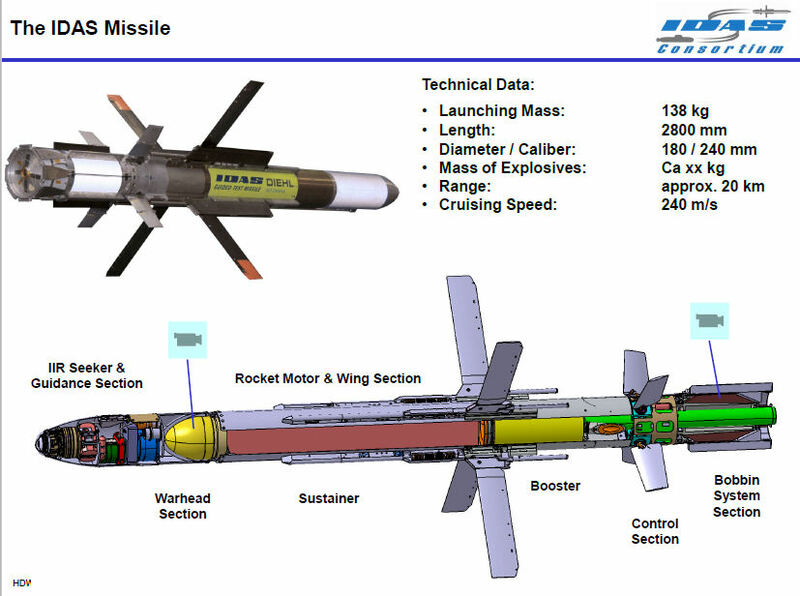 Main missile components are the imaging IR seeker taken over from IRIS-T, a fiber-optic data link between the control console and the missile as well as a single-stage, solid-propellant rocket motor providing IDAS with a mission range of approx. 20km. The operator on board the submarine may intervene in the course of the mission at any time. In addition, reconnaissance results and target images obtained by means of the seeker can be evaluated in the submarine. 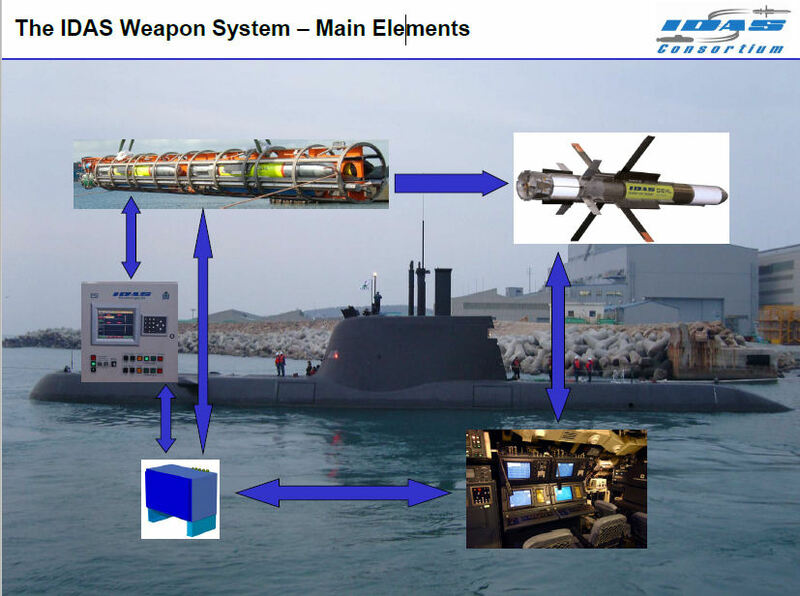 With IDAS, a modern, conventional submarine is provided with completely new capabilities (escalation), also enabling its use in new scenarios of asymmetric warfare. 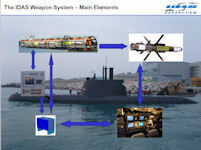 IDAS offers submarines entirely new possibilities of weapon employment. IDAS enables submerged submarines to defend themselves against threats from the air and to precisely engage vessels as well as land targets near the coast. The submarine does not have to surface, but can launch the multi-role missile from a torpedo canister under water. An autopilot and image-processing infrared seeker provides autonomous guidance and navigation. Thanks to an innovative fiber-optic data link, the operator in the submarine is also capable of controlling the missile during the entire flight providing the opportunity of target change, correction of target impact or mission abort. This monitoring of target approach combined with the high precision of the seeker and the relatively small warhead achieves the desired effect while considerably limiting unwelcome destruction in the target´s vicinity. 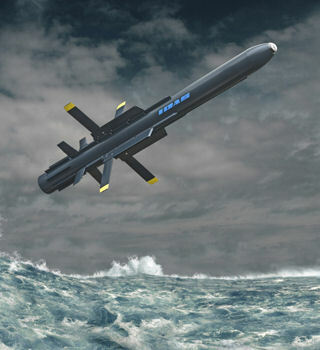 IDAS is the first guided missile to operate under water without a protective capsule, thus saving considerable costs and volume during storage in the submarine and enhancing tactical flexibility. 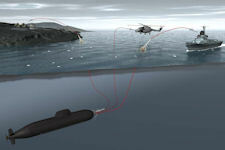 The uniqueness of IDAS is founded on the missile’s ability to be linked to the submarine’s combat operations centre via a fibre-optic cable link during the entire duration of the mission. Its imaging IR-seeker transmits images continuously via the fibre-optic link down to the operator’s console. 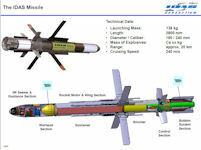 As he is able to follow the missile’s flight visually, the operator is able – if required – to change the target or to choose a different point of impact. The extreme degree of precision of the missile means that a relatively small warhead is enough to achieve the desired effect. This enables collateral damage to be avoided in a way that is not possible when deploying torpedoes or heavyweight missiles. This missile system further expands the submarine’s ability to react flexibly to a wide range of situations. The IDAS concept has shown its feasibility in successful firing tests. After having finalised its detailed design phase and qualification IDAS will be ready to go into series production. The successful maiden flight of an IDAS prototype started under water took place in 2006. In the following year, the project was awarded the Technology prize of the German defence industry. In 2008, an IDAS prototype was successfully test-fired from a class 212A submarine of the German Navy in the Baltic Sea. The IDAS consortium is conducting the Initial Development Program aiming at verification of the system with firings from a submerged submarine against real targets.